Suwon, Korea -- During the International Symposium of Rice Functional Genomics, held last 25-28 September, staff members from the Plant Molecular Biology Laboratory of the International Rice Research Institute (IRRI), headed by Dr. Ajay Kohli, received an award for a poster presented in the upstream category. 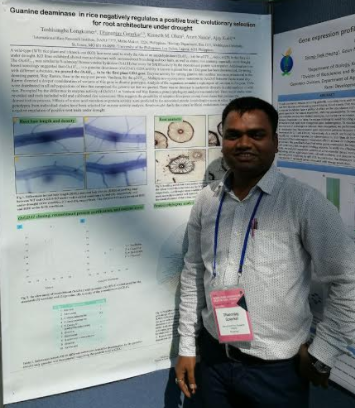 Entitled “The Rice guanine deaminase negatively regulates a positive trait: evolutionary selection for root architecture,” the poster was presented by IRRI PhD scholar Dhananjay Gotarkar. He co-authored it with Dr. Kholi and their teammates Toshisangba Logkumer, Dhananjay Gotarkar, Kenneth Olsen, and Amrit Nanda. The paper, from which the poster is based, covered the characterization of an amidohydrolase. It is a target gene of the NAM transcription factor, which is part of regulon-like QTL, DTY12.1-, which is a QTL for grain yield under drought. The amidohydrolase was found to be a guanine deaminase (GDA). This gene has not been characterized in plants until now and this discovery makes it the first reported Guanine deaminase in plants.